Margaret Craven was born in Helena, Montana, and grew up in Bellingham, Washington. In 1924, she graduated with distinction from Stanford University in Palo Alto, California and moved to San Jose, where she took a job as secretary to the managing editor of the San Jose Mercury Herald. She soon began writing editorials, first under the editor’s name, then under her own. Later she moved to San Francisco, where she met Alice B. Toklas and Gertrude Stein. She wrote short stories that were published in the Saturday Evening Post for about 20 years, beginning in 1941. She learned about the natives of the Pacific Northwest coast first from her brother Wilson, who had visited there, and then from reading published accounts. In 1962, she made a visit to Kingcome and other ancient Kwakiutl villages in British Columbia, which provided the material for her first novel, I Heard the Owl Call My Name (1967). It became a bestseller after being published in the USA in 1973. The same year, it was adapted as a CBS television movie. She went on to publish a second novel, Walk Gently This Good Earth (1977); an autobiography, Again Calls the Owl (1980); and a collection of short stories, The Home Front (1981). 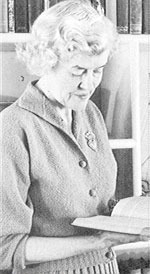 Margaret Craven is currently considered a "single author." If one or more works are by a distinct, homonymous authors, go ahead and split the author. Margaret Craven is composed of 3 names. You can examine and separate out names.